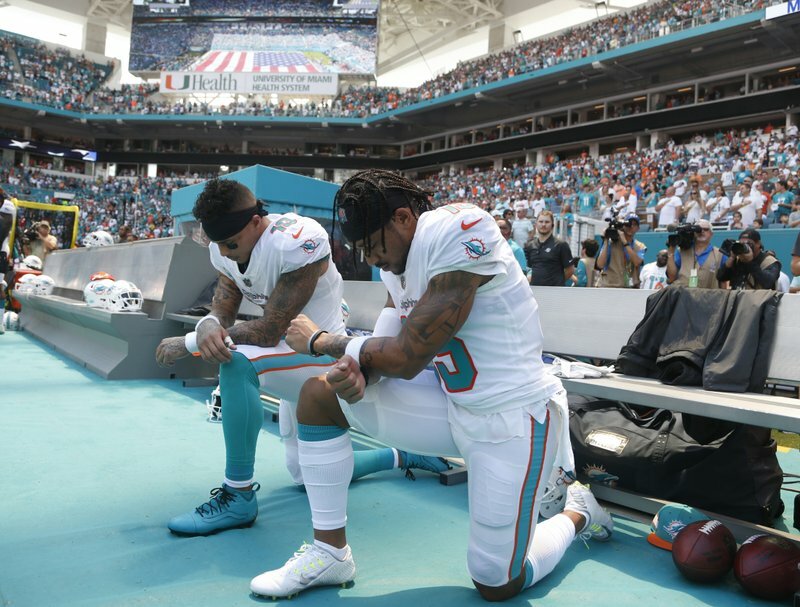 DAVIE, Fla. (AP) — There was a time when Miami Dolphins receiver Kenny Stills was bothered by the backlash over his decision to kneel on the sideline during the national anthem, his way of following Colin Kaepernick’s lead and protesting social injustice. “We’re not going anywhere,” Stills said. Stills said the Dolphins, who had established a team policy during the offseason saying that players who protested on the field could be subject to a suspension of up to four games, have not tried to stop him from kneeling. The Dolphins’ policy and all NFL punishments for protests were put on hold as the league and union negotiate. Dolphins coach Adam Gase chose the captains for this year’s team already, and Stills — just as he was last season — is one. It’s a clear sign that Gase has no problems with Stills’ stance, or his leadership capability. Stills met with reporters for about 10 minutes Thursday. There was one question about his two touchdown catches against Tennessee in Miami’s 27-20 victory. There are some, however — most notably, President Donald Trump — who insist on describing the kneeling and other similar actions, such as Oakland’s Marshawn Lynch staying seated for the anthem, as a protest of the flag. “You don’t have to agree with how or why he has chosen to exercise the 1st Amendment before every game to acknowledge the hours he gives voluntarily, on his day off, to serve his fellow Americans,” Rubio tweeted. Stills first kneeled during the anthem in 2016 and has been vocal discussing racial inequality and other issues. The player protests — started by Kaepernick, who has not played in the NFL since that season — have become a divisive topic. The debate was refueled earlier this month, when Nike made Kaepernick one of the faces of Nike’s 30th anniversary “Just Do It” campaign .